What does the ballast resistor do? The ballast resistor is an important component in the ignition systems of older vehicles. It is located between the ignition switch and the battery and is attached to the ignition coil. 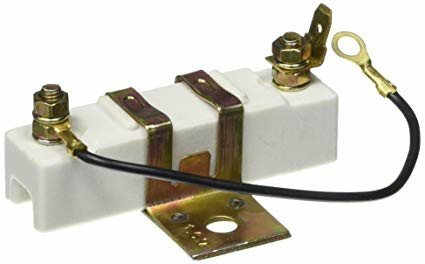 The purpose of the ballast resistor is to control the flow of electricity that is sent to the ignition coil, preventing damage to the battery and surrounding ignition components. When your car is driving, the ballast resistor will limit the voltage applied to the coil. This prevents the coil from overheating. When you start the car, this limit is removed, allowing for the spark plugs to a strong spark which ignites the air/fuel mixture in your engine. Since the ballast resistor is exposed to high levels of heat, it will eventually sustain wear and need to be replaced. Problems with the ballast resistor can affect your car’s ability to start or remain running. For this reason, it is required to replace the resistor in order to be able to start your car. Car cranking but not starting – If the ballast resistor has failed, it will often prevent your car from starting. The engine will crank when the keys are turned, but the car will stop running when you let go of the keys. Car stops unexpectedly – If the ballast resistor fails while you are driving, it can result in your car unexpectedly stopping. Ignition is necessary to sustain your engine’s combustion cycle. When the resistor fails, ignition will no longer be able to take place and the car will come to a stop. Is your car in need of a new ballast sensor? If so, we can help! At Grimmer Motors, our team of skilled mechanics can diagnose and repair problems relating to your car’s ignition system. This includes the ballast resistor, spark plugs, battery and coils. For ignition ballast resistor repairs and replacement in Hamilton, contact Grimmer Motors today!